I have to share – had cool spiritual crazy divine thing happen yesterday during our session but didn’t know till I got home. You had asked me to call on 2 spiritual entities during the guided meditation. What came to mind was Archangel Gabriel and Mother Mary. I don’t know why Angel Gabriel came to me – cause to be honest I know zip about the archangels. But someone recently, briefly shared (or I thought this is what they had shared – it was a fuzzy recollection) Gabriel was a “protector” that brings a shield of “light” …?? I wasn’t certain but I thought I’m gonna roll with it! :) he will do as one of my two. 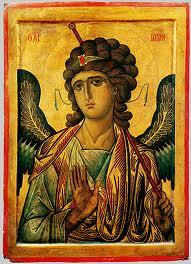 When I got home I was still thinking about Archangel Gabriel and decided to look him up……This is what I found…whoa! !…. “In the first role, Gabriel guides hopeful parents toward child conception or through the process of adopting a child. Gabriel gives strength and courage to these parents, and helps moms-to-be stay centered in blissful faith to create the best atmosphere for their baby”. Thank you! – feeling peaceful today, did not get sick this morning and my inflammation is greatly reduced…and most importantly I’m moving towards healing and strength. This message is a great reminder to be open to the support of the angels and other spirit guides. These spiritual beings jump for joy when we ask for help. However, there is another important message in this story. TRUST and GO WITH IT. When she sensed Angel Gabriel was interested in supporting her healing she trusted it even though she knew nothing about him. She went with her gut (intuitive guidance). For more on practicing this check out INTUITION. To enjoy a Transformational Healing session (in person or long distance) click TRANSFORM.